Don’t miss this cookbook, or the medical advice which accompanies it. All the recipes are easy to carry out, and technically very thorough. Here, you’ll fi nd a list of seasonal produce, as well as a fresh food calendar to help you face life with a healthy diet which is tasty, pleasant and full of anti-aging properties. One of the main concepts of anti-aging medicine is that the way to health is through your mouth. It’s necessary to eat healthily, but it’s also important to enjoy it, without gimmicks and in an appetizing, tasty and pleasant way. If not, you can accelerate aging rather than fi ghting it. There are some guid elines which can help delay the aging process. 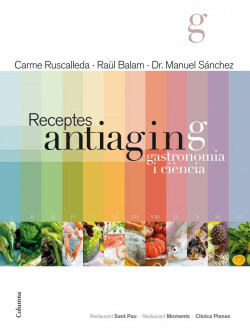 The new book by the most famous five-Michelin-starred female chef Carme Ruscalleda.